This is just a quick note to let you know the Etsy shop has been updated with lots of pretty and cute things. This little gal is one of the new toys. The yarn I used for her was a lucky find at my local thrift shop, called Beehive Loopella. I'm pretty sure this has been discontinued, which is too bad! Once washed, it is soft with a great curly, nubbly texture. 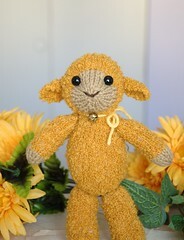 On another note, I love Ravelry! I asked in the forums if anyone knew how I could contact yarn stores, and I already have a couple of good ideas. Now I just need to overcome my modesty, and admit that most won't think I'm an annoying brat trying to sell them something useless. I'm truly no salesman, and I feel so awkward approaching strangers and convincing them to buy something from me. Doesn't help that I'm shy, neither. I had all these grand intentions of resisting for awhile, but they were all too cute and I needed to be able to make myself some of the cuteness - so I ordered the book and a pdf from Lulu... I can hardly wait to get the package. January 18, 2008 at 6:56 p.m.